On Saturday 26 May 2018 we cruised out of the Port of Port Elizabeth onboard the AB Marine Whale Watching vessel – the prognosis for seeing Whales and Dolphins was not good as Killer Whales and Red Tide had been spotted in the bay. These apex predators are highly elusive and the result of dolphins and whales ‘hiding away’ whilst the red tide chases the fish away – meaning less food and less chance of a sighting. BUT, we were rewarded with the very rare sighting of a family pod of Killer Whales cruising in the direction of St Croix Island – very special times! The killer whale or orca (Orcinus orca) is a toothed whale belonging to the oceanic dolphin family, of which it is the largest member. Killer whales have a diverse diet, although individual populations often specialize in particular types of prey. Some feed exclusively on fish, while others hunt marine mammals such as seals and dolphins. They have been known to attack baleen whale calves, and even adult whales. Killer whales are apex predators, as there is no animal that preys on them. Killer whales are considered a cosmopolitan species, and can be found in each of the world’s oceans in a variety of marine environments, from Arctic and Antarctic regions to tropical seas—killer whales are only absent from the Baltic and Black seas, and some areas of the Arctic Ocean. Killer whales are highly social; some populations are composed of matrilineal family groups (pods) which are the most stable of any animal species. Their sophisticated hunting techniques and vocal behaviours, which are often specific to a particular group and passed across generations, have been described as manifestations of animal culture. The International Union for Conservation of Nature assesses the orca’s conservation status as data deficient because of the likelihood that two or more killer whale types are separate species. Some local populations are considered threatened or endangered due to prey depletion, habitat loss, pollution (by PCBs), capture for marine mammal parks, and conflicts with human fisheries. In late 2005, the Southern Resident Killer Whales, the population that inhabits British Columbia and Washington state waters, were placed on the U.S. Endangered Species list. Wild killer whales are not considered a threat to humans, but there have been cases of captive orcas killing or injuring their handlers at marine theme parks. Killer whales feature strongly in the mythologies of indigenous cultures, with their reputation ranging from being the souls of humans to merciless killers. Worldwide population estimates are uncertain, but recent consensus suggests an absolute minimum of 50,000. Local estimates include roughly 25,000 in the Antarctic, 8,500 in the tropical Pacific, 2,250–2,700 off the cooler northeast Pacific and 500–1,500 off Norway. Japan’s Fisheries Agency estimated 2,321 killer whales were in the seas around Japan. Killer whales are apex predators, meaning that they themselves have no natural predators. They are sometimes called the wolves of the sea, because they hunt in groups like wolf packs. Killer whales hunt varied prey including fish, cephalopods, mammals, sea birds and sea turtles. Different populations or ecotypes may specialize and some can have a dramatic impact on certain prey species. However, whales that inhabit tropical areas appear to have more generalized diets due to lower food productivity. 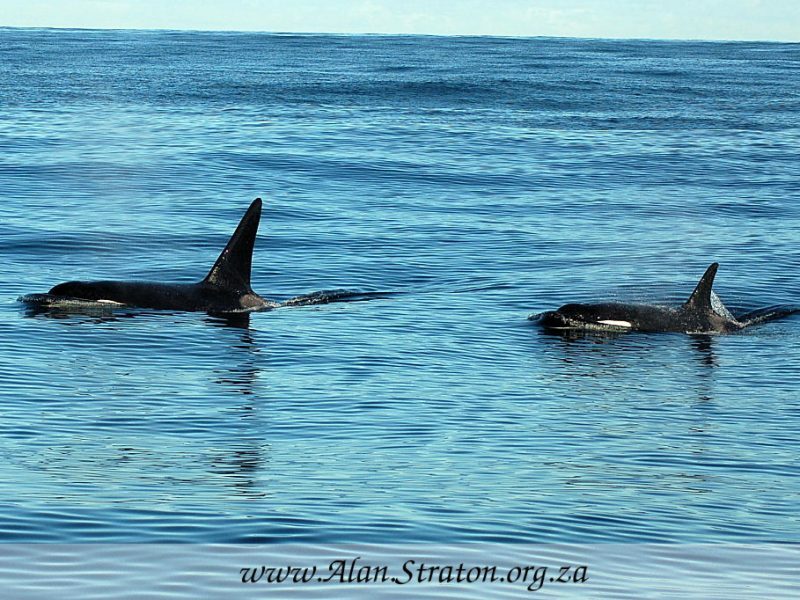 Previous Post: « Algoa Bay a memorable trip of a lifetime!